A root canal procedure is a dental procedure performed when it is necessary when a badly decayed or infected tooth needs to be saved. A root canal procedure involves removing the nerve and the pulp from the center of the tooth, and then cleaning and sealing it. Located in metro Columbus, The Dental Center at Easton provides comprehensive dental care including root canal procedures for patients in the north-eastern Columbus metropolitan area. The “root canal” refers to the natural cavity that is located in the center of the tooth. The pulp chamber of the tooth is the soft area inside of the root canal. You will find the tooth’s nerve is within the root canal. There are numerous reasons as to why you might need a root canal procedure: cracks, severe tooth decay, large fillings, repeated dental procedures, chips, or facial trauma. Any one of these can cause a tooth’s pulp area to become inflamed or infected. If left untreated, the tissue surrounding the tooth will become infected and might even cause an abscess. Why have your root canal performed at our dental center? Because you will find at The Dental Center at Easton, patients come first. We keep the patient in mind when we design or process or service. We pride ourselves in taking the the time to get to know each of our patients. This enables us to provide personalized and high quality care in order to meet their needs. Having a positive patient experience is our goal, whether you come in for a routine checkup or a root canal procedure. The Dental Center at Easton Town Center offers convenient hours and quick pediatric dental procedures under the expert care of Dr. Gilmer. When you and your children visit us, you will find an experienced staff that can help make your kids smile, assisted by dentistry techniques and practices designed with your child in mind. Our cutting edge technologies ensure that you are receiving the most effective and current treatments, and our friendly and professional staff makes sure that your children always receive the best in care and treatment. 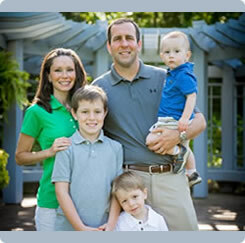 Pediatric dentistry is a great way to maintain those smiles in your family! Call us today to learn more about our services and to set up an appointment.